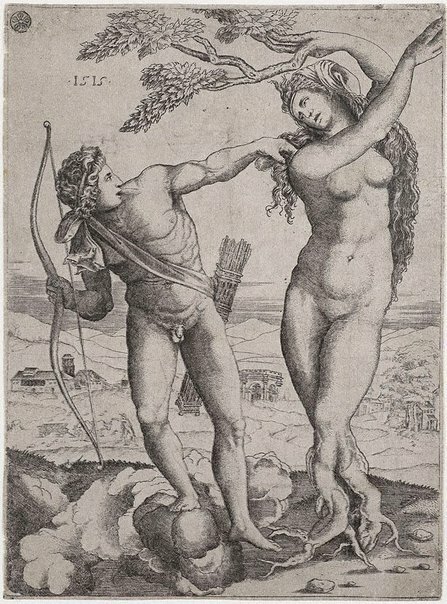 Agostino began his career in Venice and Florence where he made engravings after Giulio Campagnola, Baccio Bandinelli and Andrea del Sarto. In 1516 he went to Rome, where over the next decade he produced numerous engravings after Raphael. The subject illustrates the legendary transformation of the Daphne into a tree as she is pursued by Apollo. The mark in the top left corner is that of the 18th-century English collector, Sir Edward Astley. Not signed. Dated u.l. image, [incised plate] "1515".